Spring and Summer are here and my daughter is already asking for strawberry shortcake, her all time favorite dessert. With Memorial Day around the corner, Fourth Of July, Family gatherings, family reunions, friends getting together, whatever the event, you an be sure that Strawberry Shortcake on the Menu will be a sure fire winner! This is a great go-to dessert idea to use all summer long! 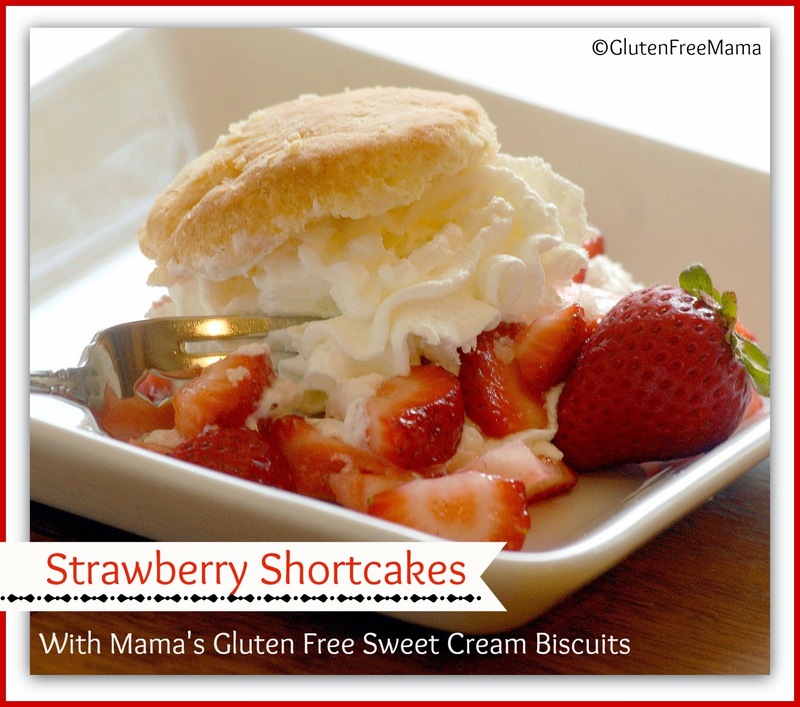 Use Mama’s easy recipe for Sweet Cream Biscuits or use if you have Mama’s Scone Mix hanging around, you can make a single batch of plain scones, then cut each scone in half and fill with Strawberries and Cream. The scones recipe is egg free. You can use the “flax eggs” for egg free if making the sweet cream biscuits. Both the Sweet Cream Biscuits Style and the Scone Style are sure to impress your family, friends, and guests. Change it up a bit and make Peaches and Cream, or use fresh Raspberries and Cream. These light and flavorful biscuits and scones also are perfect served with butter and jam during your summer brunches on the patio. ½ cup butter, or dairy free margarine, room temp. Simmer together 2 Tbsp. ground flax with 1/2 cup warm water for 5 minutes, or until thick. Set aside to cool. Directions: Preheat oven to 400°. In a medium bowl combine flour, sugar, baking powder, salt, and xanthan gum. Mix well. With a fork, work butter into flour mixture until the flour resembles coarse pea size pieces. Make a well in center of flour. In a liquid measuring cup measure whip cream. Crack eggs and add to whip cream. Lightly beat eggs into whip cream. Add cream and eggs all at once to flour mixture. Work flour into liquid ingredients until all flour is mixed in. Dough will be wet and sticky. Generously flour pastry mat or counter. Spoon about 1/3 of dough onto floured surface. Sprinkle top of dough with flour. Gently roll dough to about ½ – ¾ inch thickness. Using a biscuit cutter cut out biscuits. If you don’t have a biscuit cutter you can use the rim of a round glass. Place on biscuits about 2 inches apart on an ungreased baking sheet. Bake for 14-16 minutes or until biscuits are golden brown. Allow biscuits to cool for 10-15 minutes. Slice in half and serve with whip cream and cut strawberries or peaches. Pour cream into mixing bowl. Using wire whisk attachment beat on high speed until light peaks being to form. Add sugar and continue beating until stiff peaks form. 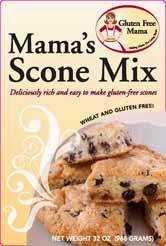 Use Mama’s Scone Mix and make a batch of plain scones and they make perfect strawberry shortcakes too! 1 Batch of Mama’s Scone Mix. Follow the instructions on the bag, omitting any extra ingredients. We want to make them plain. But before baking, do baste with cream and sprinkle the top with coarse raw sugar. You can buy xanthan gum at many grocery stores near the baking isle. You can also buy it at Amazon.com. We will have it available for sale at Gluten Free Mama this fall. Kroger and Health Food Stores carry zanthan gum. Check around for best prices.